A lively combination inspired by the brash boldness of New York City's borough of Manhattan. Big flavour but with a cool sophistication sure to wow party guests. Stir the onion salt, sesame seeds, poppy seeds and black pepper on a plate. Cut a wedge from the lemon and rub around the rims of two martini glasses to cover in juice. Then dip the rims into the onion salt mixture to coat. Add the V8®, vodka, vermouth, Worcestershire sauce, chilli sauce, celery salt, olive liquid and remaining lemon juice to a cocktail shaker. Add ice and shake to chill. 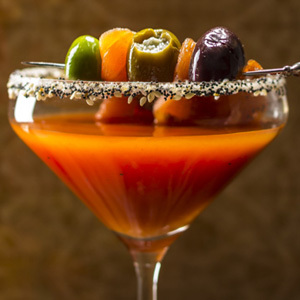 Strain the mixture into the prepared martini glasses and garnish with pimento-stuffed olive and/or slices of lemon.